Jesus’ disciples tell Him that the crowds who followed Him were confused about His identify, but was their own understanding much better? St. Luke writes about a conversation Jesus had with the disciples that began with a question He put to them. St. Matthew gives us a longer report on this in his Gospel (see Mt 16:13-21). It differs, in some ways, from this one, but in emphasis, not content. What did St. Luke consider noteworthy in this exchange? First, we discover that Jesus “was praying in solitude” when He decided to ask the disciples, “Who do the crowds say that I am?” This helps us recognize that the conversation that follows is the fruit of private communion between Jesus and the Father. 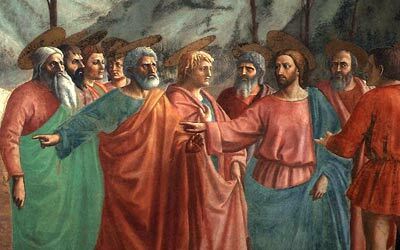 Jesus knew that it was His Father’s will to reveal Himself to these twelve men. As He later says in prayer to God, “I have given them the words which You gave me, and they have received them and know in truth that I came from You” (Jn 17:8). The disciples tell Jesus that the people believe He is a great prophet, in the tradition of John the Baptist or one of the ancient prophets. Do we wonder what the disciples’ reactions were when they heard people conjecturing about Jesus’ identity this way? Did they know what to say? Actually, Jesus does want to know how the disciples would answer this question: “But who do you say that I am?” Peter responds right away: “The Christ of God.” We know from St. Matthew’s Gospel that it was God Who enabled Peter to know this about Jesus. It was not something that simple companionship and close observation would have produced. St. Luke tells us that Jesus did not want this revelation to be announced yet. Why not? Why wouldn’t He want His disciples to correct the misunderstandings of the people who flocked to see Him? Probably it was because of what He said next. Although Peter and the other disciples were beginning to comprehend that Jesus was no ordinary prophet, that He was Israel’s long-awaited Messiah, Jesus knew they needed to know more: “The Son of Man must suffer greatly and be rejected by the elders, the chief priests, and the scribes, and be killed and on the third day rise.” Did Jesus say these words slowly, making eye contact with each man, hoping they would sink in? Surely this was not what any of the disciples expected to happen to the Messiah. We know, from other Gospel accounts, that the disciples did not understand this kind of talk from Jesus. Yet He knew they needed to hear it, and there was something else they needed to hear, too. “If anyone wishes to come after Me, he must deny himself and take up his cross daily and follow Me.” All this talk about death! What must the disciples have made of this when they first heard it? To us, now, the idea of “the cross” is noble, because it is forever associated with Jesus’ death for us. But what meaning could it possibly have for the disciples before they watched Jesus go to His Cross and hallow it? All they knew then about “the cross” was that it was the Romans’ brutal way of punishing criminals. Jesus was calling His followers to daily self-denial (“not my will but Thine be done”) so radical it could lead to martyrdom. “For whoever loses his life for My sake will save it.” What kind of sense could this make to the disciples before they witnessed the Resurrection? However, regardless of how much of this conversation was lost on them at the time it actually took place, there is no missing the fact that Jesus clearly announces His own Death and Resurrection—and ours, too, if we love and want to follow Him. What would “the crowds” make of that? What would we? Possible response: Lord Jesus, why is it so easy for me to forget that You call Your followers to daily death and resurrection? To self-denial that leads to true life? When we read Old Testament passages like this one, sometimes we wonder why the Jews of Jesus’ day weren’t expecting a Messiah like Jesus. Here is a prophecy that powerfully describes “the inhabitants of Jerusalem” who, someday, will “look upon him whom they have pierced, and they shall mourn for him as one mourns for an only son.” What else could this be if not the Crucifixion? We know that now, of course, but it took the Incarnation for the words of Scripture to be fully revealed in all their deepest meaning. It was not possible for the Jews to understand that, as Jesus told the disciples on the road to Emmaus, all the Old Testament Scriptures were actually about Him (see Lk 24:25-27) until He had lived, died, and rose again. In wonderful irony, the very disciples who can seem so dense in the Gospels were the ones who, in the Book of Acts, preached that in Christ “a fountain to purify from sin and uncleanness “ has been opened for the whole world. Redemption! Possible response: Lord Jesus, thank You for being willing to undergo death so that I can be cleansed from sin. Our mourning has turned to joy. St. Paul helps us understand what Christ’s Death and Resurrection, prophesied so poignantly in our first reading and repeated in our Gospel, have accomplished. Jesus has truly become “a fountain to purify from sin and uncleanness,” as Zechariah wrote. In fact, St. Paul goes so far as to say that when we, through faith, are baptized, we have “clothed” ourselves with Christ (Note: Pope Emeritus Benedict XVI has written that the vestments the priest wears during Mass express this beautiful truth). He has become our life; we belong to Him in the oneness of His Body. This makes us, the Church, “Abraham’s descendants, heirs according to promise.” Christ has renewed a people for God, bringing to completion the plan that existed before time began. Remember when Jesus called His followers to let go of their lives in self-denial in order to have real life? This was the life He was talking about, and it is worth whatever it costs us. Possible response: Heavenly Father, I remember that you clothed Adam and Eve in animal skins after their Fall. Now, You clothe us in Christ, Your Beloved Son. What wondrous love this is!